By now the story behind the story has almost over-taken the novel. 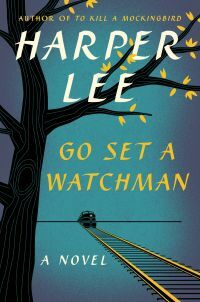 Originally written before To Kill a Mockingbird, but returned to Lee by the publisher requesting she flesh out the childhood flashbacks of her protagonist and make something of that instead, Go Set a Watchman is both a prequel and a sequel (or a prequel sequel if you will). When you read those flashback scenes, it’s easy to see why the publisher was more tickled by those, and perhaps the tone of the rest of the novel was too volatile at the time. Lee has quite the gift for gab, and in her dialogue, which is both colorful and occasionally pedantic (Scout’s voice is clearly a vehicle for some impassioned politic views) she has crafted a book that is almost all talk. Her dialogue perfectly captures place, time and feelings…it’s as if she has transported us back to the Deep South in the 1950’s at the dawn of the Civil Rights Movement that would define a generation (a nifty almost post-modern trick as when she wrote this – this was now). At times, it reads more like a play – and I can picture actors up on stage reading their lines with great vigor and theatrics. If there is to be a film version, Go Set a Watchman will bequeath a plethora of juicy Oscar roles for some lucky thespians. One can’t help but wonder how someone like a Sidney Lumet – sadly now deceased – would’ve handled the material. It could’ve been a contemporary companion piece to his masterful Twelve Angry Men as here we have One Angry Woman against the entire Deep South. The novel’s dialogue is rife with literary and religious allusions, courtesy of Scout’s educated upbringing and her eccentric uncle. Scout is our eyes and ears (as well as our heart) as we are presented with the harsh truths of the Deep South, while her uncle is our Chesire cat-smiling guide. There’s of course the titular biblical allusion (“Go set a Watchman and have him report what he sees”) where the gender roles are flipped and Scout is indeed our Watchman (and her name is even more precious), but her uncle also alludes to “…to the dark tower came” where the dark tower can either be seen as Atticus or the Deep South or both. After writhing with vitriol, our story’s end feels a little too pat. Did her uncle convince Scout to stay as the South needed people like her more than it ever had before? She seems all to easy to forgive her father, though in finding the separation in their once unified conscience, she has finally become an adult. The novel does feel incomplete and makes one wonder had Harper Lee intended to continue the tales of Scout? Apart from being an engaging time capsule, Go Set a Watchman is just as much a coming-of-age story as was its predecessor. Were we to always visit with Scout at pivotal points in her life – childhood, young adulthood – maybe middle-age and old-age? We might never know, which makes this rare re-visit all the more rewarding and worth treasuring, like Atticus, warts and all. This entry was posted in Book Reviews, Books, Literature and tagged Alabama, Atticus Finch, Civil Rights, Coming-of-age, Go Set a Watchman, Harper Lee, Jean Louis Finch, Literary Events, Literary Sequels, Maycomb County, Scout, The 1950's, The Deep South, To Kill a Mockingbird. Based on the early reviews and some of the controversy over certain plot points, I was a bit fearful in picking this up. I read TKAM in my 8th grade English class and have loved it ever since, so I wasn’t sure what my reaction to this would be. I agree with the people who say that this clearly reads like the first draft of a novel, but it’s a really good first draft. And her editor was right: the writing in this is strongest in the flashbacks. The present-day (for the time it was written) segments wandered and rambled a bit but were no less captivating in her ear for dialogue and her eye for detail. This novel’s impact, for me, came from a realization that Scout comes to and that I think most people come to at some point in their lives: the people we revered as children–be they parent, sibling, relative, friend, teacher, etc.–are sometimes not as perfect as we remembered them, and that revelation can sometimes prove too much to bear. Scout’s exchanges with Atticus at the end of the novel were both powerful and heartbreaking. I enjoyed returning to Maycomb and spending time with these characters again, even if it was in a less-than-perfect but still enthralling piece. Thanks, Chris, for sharing your thoughts. I think you and I took the same messages (and enjoyment) from this book. David, you have pointed out some good things about the book. GSAW has an inherent problem though: Lee does not address the issue of why Atticus – a man of integrity and lover of justice (Chapter 9) – changed into a racist, or has he been a closet racist all the years? And if so, while Scout has such a close relationship with her dad how could she not have found out earlier until now, in his 70’s? Even after Scout has moved to NYC, she still makes her annual trip back to Maycomb as the first chapter states why suddenly ‘discovers’ Atticus a racist? Just like the manuscript suddenly being discovered a short few months after Lee’s legal counsel and protector of her privacy – her sister Alice Lee – had died. The book is the first draft and shouldn’t have been published. That it is touted as the sensational ‘sequel’, a ‘new novel’ from Harper Lee is too obvious a marketing scheme, as Joe Nocera of the NYT op ed says, “Go Set A Watchman constitutes one of the epic money grabs in the modern history of American publishing.” My view here. Arti – do we always understand why people are they way they are in real life? Do we not go through childhood with rose colored glasses looking up to our perfect idols (and is it not until “all of a sudden” at some point in adulthood that we realize no one is perfect?). I actually think the book did a good job of trying to explain Atticus’ “change of heart.” He never really had one, in my opinion. He believed in justice (which is why he defended an innocent black man in TKaMB) but one can defend an innocent person and still believe that person (and their kind) should be segregated. Atticus is a character with shades of grey – life is not always black and white even when some people believe down those lines. He also didn’t espouse his segregationist thoughts until he (and the rest of the Deep South that thought that way) had a reason to because they felt threatened by the Civil Rights Movement and the NAACP. And I also think his brother’s story about why he went to the Clan rally was very telling – he did so because he needed to know who was under those masks as he didn’t trust anyone who was hiding. At any rate, after reading your post on your blog, I think you focused too much on the “story behind the story” and the somewhat questionable publishing practices that lead to this release instead of focusing on the actual book (which surely has its problems, some of which you point out well) – but bottom line, this is very well written (far better written then most best sellers these days), evocative story that challenges our preconceived notions about heroes and growing up. As such, I think it makes a great companion piece to TKaMB.